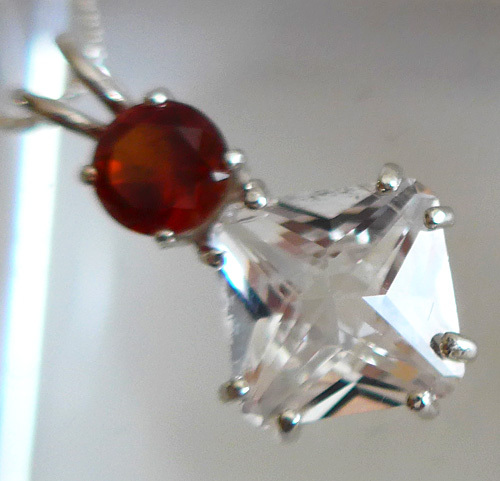 Dimensions (HxWxD): 1" x 0.55" x 0.375"
This rich orange red Hessionite Garnet Mini Magician Stone pendant with its round and gorgeous pale pink Danburite accent stone really sparkles! It has tremendous bling & a warm glow to it & is a very powerful piece offering protection and beauty to the one who wears it. The polished and cut stones are set into a sterling silver setting which allows them to breath and comes in a black velveteen pendant box for safe keeping. The pendant hangs on its sterling silver chain right on the thymus between the throat and the heart chakras, offering protection to the whole body resonating through the compassionate heart. The combination of Danburite with Hessionite Garnet is considered to be very protective, helping us to clarify situations by staying connected to our Higher Selves while at the same time assist with grounding and centering. 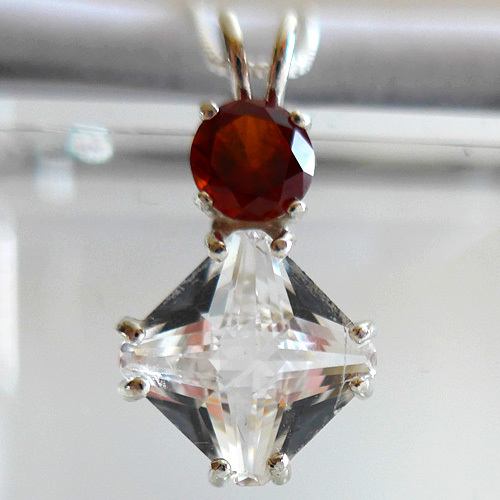 Paul Jensen, the designer of this line of pendants says of Hessionite Garnet: "encourages the embodiment of our own divinity. Restores both innocence and grace. Teaches a child-like approach to life. Note: Weight above is shipping weight. Actual weight is .20 oz. Each piece is unique and may vary slightly in appearance. Each piece is guaranteed to be beautiful and to meet with your complete satisfaction.